Sweet and fudge-like, brownies are a classic bake sale treat or dressed-up dessert. While cookies and cakes typically rely on baking powder as leavening, brownies require less leavening and can be made with baking soda in place of baking powder. 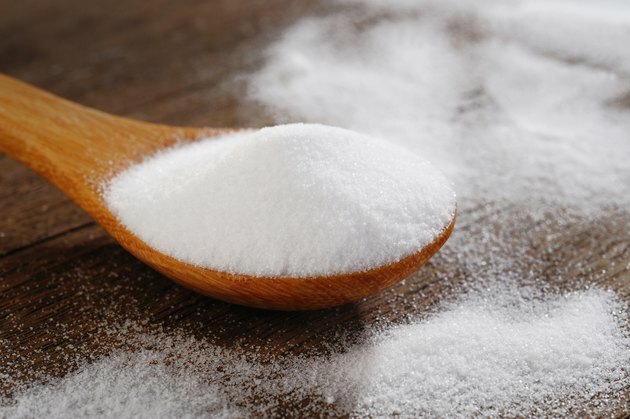 Choose a recipe that relies solely on baking soda or create your own substitute for baking powder by combining baking soda and other ingredients. The most basic brownie recipes eliminate the leavening question altogether. You can make a rich and delicious brownie with a moist and chewy texture with no chemical leavening at all. These recipes rely on eggs to help the batter rise in the oven. If your usual brownie recipe calls for a very small amount of baking powder, you may find that you can simply leave out the baking powder altogether rather than substituting baking soda in its place. While some brownie recipes include no leavening at all, others rely on baking soda to help the batter rise. Baking soda is one of the components found in baking powder. To create the chemical reaction that leavens the dough, baking soda must combine with acidic ingredients. In brownie recipes, the acid comes from cocoa powder. If you're using a recipe that calls for baking soda, be certain that you use traditional rather than Dutch-processed cocoa. If you prefer a cake-like brownie or your favorite recipe requires baking powder, you can create baking powder at home with baking soda plus an acidic ingredient. Combine 1/4 teaspoon of baking soda with 1/2 teaspoon of cream of tartar for each teaspoon of baking powder called for in your recipe. This substitution is quite successful and mimics the chemical composition of baking powder to help create a higher and less dense brownie. Experiment with leavening to find the combination that works best for your tastes. The simplest brownies contain little more than eggs, chocolate, butter, sugar and flour. This combination produces a dense and rich brownie with a dark chocolate flavor. Recipes that include cocoa powder and baking soda rise somewhat higher but remain quite moist and fudge-like. Adding baking powder or a combination of baking soda and cream of tartar to a brownie recipe makes it much more like chocolate cake, creating a lighter and airier texture.